For BLINDSIDE SCREEN SERIES 2017 Channels Festival 2017 presents a new commission by Melbourne-based South Sudanese artist Atong Atem. 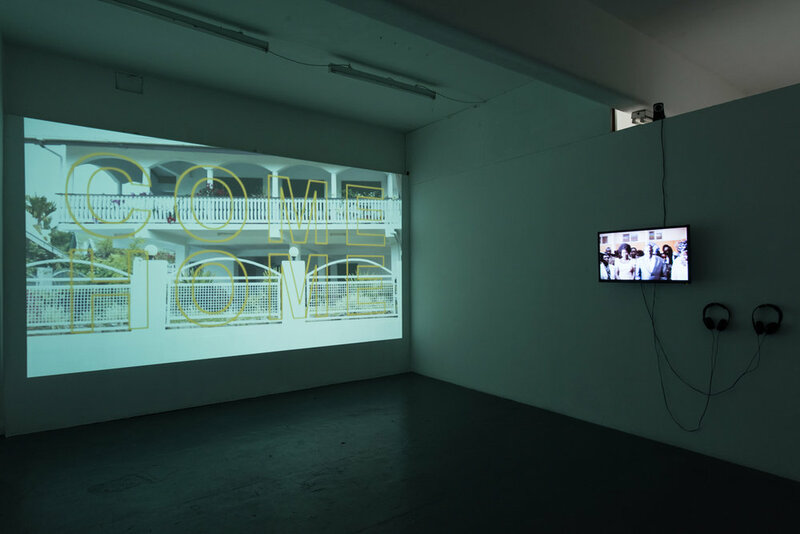 For Come Home Atem has created three new videos which create connections between abstract concepts of home and the introspection of existing in the art world as a displaced person. Using home videos and footage shot by the artist – during her travels and in her studio – Atem combines these moving images with personal and reflective texts to create a simulated, multi-layered narrative. There is an ongoing reference to liminality across all these works, reflecting on the experiences of living between places, between cultures and between expectations. In COMEHOME, the work’s title phrase alternates against various phrases starting with the word ‘NYAN’, which in Dinka means girl. With its bold, repeating phrases a question immediately emerges: where is ‘home’? NYAN CE MÄR – lost girl. Using these texts and subtitles across her videos, Atem reflects on herself as a translator – both literally and as an artist. In a memory, a dream, Atem contrasts footage of a family wedding with written reflections about relations and disconnections from family, traditions and culture. She continues these self-reflexive questions Facial Geometry II, combining time-lapse videos of herself painting her face, with subtitles that express observations, concerns and questions to herself and to the larger art world. Atong Atem is a Melbourne based artist whose work gravitates around her South Sudanese heritage and its relation to forming identity in Australia. Selected exhibitions include: Us, Customs House, Sydney, 2017; The Process of Feeling, Centre for Contemporary Photography, 2017; Rec Room, Interlude Gallery, Sydney, 2016; Make Nice, Vivid Ideas, 2016; Nataal- New African Photography, Red Hooks Lab, Brooklyn, 2016; Ua numi le fau, Gertrude Contemporary, Next Wave Festival, Melbourne, 2016; Ouroboros, First Draft, Sydney, 2015; and Stayfly Sydney Block Party, Ambush Gallery, Sydney, 2013. Atem was the inaugural winner of MELT Portrait Prize 2016, presented in conjunction with Brisbane Powerhouse. Channels, The Australian Video Art Festival is the only festival dedicated to showcasing new contemporary moving image by some of the most exciting Australian and international artists. Presented from 1 – 10 September 2017, Channels will deliver a diverse and inspiring festival of exhibitions, screenings, talks, public engagement programs and a series of international exhibitions and events. In 2017 we look to the future. In dialogue with artists, curators and the community, Channels poses an open question about the future and speculative narratives which explore the uncharted territory of histories yet to be established. The theme ‘futures’ is an invitation to artists and collaborators who are experimental and innovative with their medium and ideas, exploring future selves, ideas, movements, politics and technologies. IMAGE | Atong Atem, Facial Geometry II, 2017. digital video, 9:07min. Image courtesy of the artist. Channels is supported the City of Melbourne Annual Arts Grants Program and assisted by the Australian Government through the Australia Council, its arts funding and advisory body.